commando lock co could make them in laminated cases, and add the feature of the serrated edges used in the western electric phone locks. I used to own the "california" i think my brother has been using it for a paperweight for 3 or 4 decades. Escher, the only time you can feel gates is usually when there is a sticky lever or two. The sticking tends to happen because the fence lever is not perfectly pendicular to the lever stack or because of debris between levers. Rai, I agree with you on the pick resistance, and I was thinking the same thing just yesterday, about bringing these locks back to market. 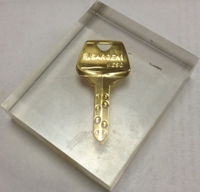 FYI Rai, a California pancake lock sold for $950.00 dollars on Ebay last month. I was a little off on the value when I last talked to you. It just depends on how bad someone wants the lock. Lauren, I understand the principle - like the tumblers on a safe, there will always be some imperfections whereby one disk (or lever) will be different than the others. That is the point of safecracking and should apply to a lever lock as well. In a safe there is no "shackle" to pull either, only the constant weight that presses the fence against the tumblers. Here, the constant pressure is provided by the spring on the "actuator" lever. Rai, as pointed out in "High Security Mechanical Locks", Fichet and others used the same principle in higher end locks. ( See page 382.) The concept has already been established as high security so reviving it would not be a stretch. Lauren wrote: ......This picture must have been taken with the fence removed. In reality, there is not enough lever displacement capability to expose this gate before bottoming out. This issue usually occurs with all depth cuts greater than .105 inch. Yes. Absolutely correct. The guts of the lock had been removed to get a clear picture as seen just above.. The idea was to show the tip of the probe hooking into a gate, rather than showing how to specifically measure lever two. I was able to wiggle my probe between the levers, but perhaps other locks might be tighter. Hence this bit of explanation. When you measure the deepest gates the lever you are moving to put your tool in place can sometimes reach full travel before you get the tip of your tool in the gate you want to measure. If this happens, you can try to slip the tool between the levers intentionally, or you can just mark down the measurement as unknown. When you are making your key leave this lever till last and take a few thou and try the key. Repeat this procedure until the key works. Lauren did you make the original "caliper" type tool with the two wires ?? If so I would love to see some pictures and a little breakdown of the tool in use. It seems like it might be a more reliable method for someone working with these locks. Especially the more expensive collector types. If you dabble with antique locks, then it is essential to buy a $10.00 contour gauge from your local hardware store. I use these needles for making various tools. I often made the calipers from these wires using small black zip ties to hold the needles together. I think Wizard uses shrink tubing. This worked out fine until I was finding "Champion" locks that had very tight tolerances preventing the insertion between levers. Then I learned that the caliper could be inserted on top of a neighboring to access a neighboring gate. I thought this second technique was fool proof until I encountered my pre-1903, high shackle "Champion" lock. Three of the lever gates would not window. I made a special tool for holding down a neighboring lever while probing, so work space wasn't a problem. Anyway, now I use very thin piano wire for making "Z" side of the calipers (.010 inch), and I use a needle from the contour gauge for the other side. I have a wonderful Dix Pix-style tool for decoding and opening these locks. But I must stress, this tool is not a pick. I refuse to make false representation of what this tool is capable of doing. I'm in the process of inventing some other techniques for reading those hard levers that I discussed earlier. A couple of people have mentioned the Dix Pix and I wasn't sure what that was, so I Googled it..
Looks like I reinvented the wheel a bit with my original method. You weren't the only one. The entire method of decoding these locks was demonstrated on this site. The process was crudely done in my opinion. I later discovered this page after I invented my own procedure. I really would expect something better from such a worthy collector. The Dix PIX page is nothing more than a commercial without any outside backing or testing without bias. The claim of picking is completely hearsay. I make locksmith tools, and if I thought this tool did everything what it claimed, I would have promoted it a long time ago. I've actually considered a pancake lock but was thinking more in line with the "puck" style we see on the back of commercial vans. We coul build up the inner and outer profile with laminations, then braze and carburize/harden the case (we have a patent for that). I'll pay more attention to the guts on the lock ya'll are discussing but I have more work to do on our first laminated series before I take on that monster! I cant wait to see the results if you do end up doing this. Funny thing happened last week. A friend at the factory gave me an old Sargent 6 Lever lock for my collection. I had never even heard of one before reading your thread. I won't be tearing it apart but I'll post some pics of it later....I'm going to need help picking it. Funny, I was reading this post last night and happened upon one of these today. W/O a key though. I just got one myself, with a key! I have a Champion I have yet to decode tried once but couldn't get the wire (.007) between the levers. I will have to find a way to depress a lever and then gauge the adjacent one(s). Another project on the back burner for now I guess. However I do have an identical lock on the way maybe just maybe the key will work for both although that seems unlikely as I would imagine the gate could be machined into any spot on the lever creating the possibility for 1000's of bittings. I need to do more research here as my 2 locks are "Champion 6 Lever" Pancakes without the pin over the "H". Probably post 30's from what I've dug up so far. If anyone can dig up a catalog and/or manufacturing dates or data sheets for the Millers that would be appreciated. Research so far covers links in this thread and my link in the "Historical Catalogs and Curiosities" thread as well as HSML and a couple of others (Antique collectors sites) I have bookmarked somewhere. I go between levers when I can, but now, I merely hold down a nearby tumbler. This creates a window for accessing the gate. For example, holding down lever 2 provides access to lever one and three, and holding down lever four gives access to lever 3 and 5. These are just some examples, but you will get the idea. I also sell decoding jigs for these locks. It's a must-have tool if you are serious about making keys for these locks. There will be cases were access to deep cut tumblers is very difficult and you may have to guess. It's happened to me already. Fortunately, I had my jig and I guessed right. FOR SALE: QTY. 1 DECODER (WITHOUT 9/64 ALLEN WRENCH). DESCRIPTION: THIS TOOL IS MY OWN PERFECTED DESIGN. THE TOOL IMPRESSIONS THE TUMBLER STACK WHEN THE LOCK IS PICKED OPEN. THE TOOL CAN BE USED FOR MAKING A KEY BY USING THE OPPOSITE END AS A REVERSE IMPRESSION. THE TOOL BEHAVES AS A WORKING KEY WHEN TIGHTENED. THIS TOOL IS NOT A PICK SIMILAR TO AN ACE PICK. THE NEEDLES OF THE TOOL CAN BE SET TO DESIRED DEPTHS BASED ON DECODED DATA (DIAL CALIPER REQUIRED FOR SETTING DEPTHS). THE TOOL WORKS ON CHAMPION PANCAKE LOCKS AND MANY OTHER MANUFACTURERS. I WILL FILL ORDERS ONE AT A TIME, BASED ON SUPPLY. PM ME FOR INVENTORY FIRST.